The True Story of Mary Cook, Part III: Wagon Trains, Gold Rushes, Shipwrecks, Wars, Fires, Earthquakes, Love & More! Editor’s Introduction: Here is a story that will interest all kinds of readers. This is a tale brimming with drama, history, and incredible events. And for family historians, this tale is a vivid reminder that our ancestors’ lives were filled with stories just waiting to be discovered – though perhaps not all as astonishing as this one. Intrigued, we invited Casey to tell our readers his aunt’s story, which you are about to read. (Casey is an accomplished writer. If you enjoy this story, check out his website: Write Me Something Beautiful.) Such a long and eventful life as Mary’s requires a bit of story-telling, and so we are presenting the tale of Mary Sawyers Swan in three parts over three days. Two days ago we posted the first part: The True Story of Mary Cook, Part I. Yesterday we posted the second part: The True Story of Mary Cook, Part II. Today we present Part III, which tells the rest of Mary’s remarkable life. Casey’s Introduction: This whole story started when I was adding Mary to my family tree about eight months ago. I got a “hint” – two sentences – that Mary, her baby, and husband Sam were on that fateful last voyage of the SS Central America. I had never heard or read one word about that. I began to chase down the story. There were family records about the wagon train trip in 1854 and the Indian attack when Mary’s oldest sister, Melcena, was seriously wounded. But all the rest was news to me. Fortunately, Mary’s story was told and preserved through first-person interviews Mary, her brother Mountjoy, daughter-in-law Bertha Cook, and others (including those who were rescued from the Central America) gave to the newspapers. And of course, having the ability to now more easily track down those old newspapers online enhances the research capabilities. I also received a lot of help from researchers at the Library of Congress and San Diego State University, and the Mendocino County Historical Society. Everyone was so helpful, and I think they had fun digging into the story. I think that is a good message for all family historians: Everyone has a story out there waiting to be discovered – you just have to do a little “mining” and take advantage of the wonderful tools out there. This is the very true story of my 3rd Great Aunt, Mary Elizabeth Sawyers Swan Cook (1839-1924), regarded as one of the early pioneers and “mothers” of California. Her story is packed full of romance, adventure, danger, history, courage, love, tragedy, strength and fortitude. Mrs. Cook was caught in the web of an uncanny number of infamous events and persons that define who Californians and Americans truly are. Her story will be passed down to my grandchildren, themselves 6th generation Californians, and the generations to come. Captain Herndon’s daughter, Ellen, was 20 years old when she lost her brave father. She had become engaged the year before to a young lawyer named Chester A. Arthur. They married in 1859 and their first child, William, was born in 1860 – but tragically, passed away in 1863 before reaching the age of 3. Another son, Chester Alan Arthur, Jr. was born the following year. Photo: President Chester Arthur, 1882. Credit: Charles Milton Bell; Wikimedia Commons. Arthur Sr. became actively involved in the Republican Party, and held important posts in New York and Washington, D.C. In 1880 he was selected to run as Vice President alongside Presidential candidate James A. Garfield. 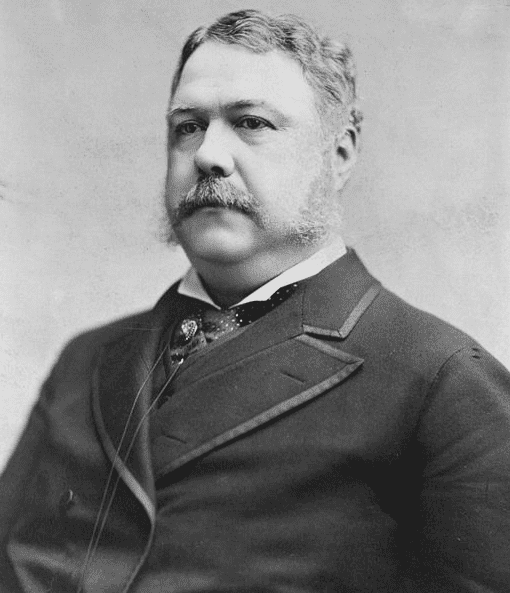 Chester Arthur became the 21st President of the United States when President Garfield was assassinated in September of 1881. Arthur served as President through 1885, but due to failing health elected to not seek reelection. He passed away in 1886 from kidney failure. Upon arriving in New York City, Mary and her young daughter Lizzie were put up in a hotel and did not want for anything. Food, clothing and other essentials were donated by the generous New Yorkers. Of course, Mary also had Sam’s money belt with $10,000 of gold coin and dust which she guarded with her life. The American Civil War broke out in April 1861, and Mary enlisted as a Red Cross nurse with the Union Army. (4) Around this time, Mary relocated to Pennsylvania. Pennsylvania was very much involved in the war, and every man, woman and child was impacted by the bloody conflict. It is possible Mary served as a nurse in Washington County. Although it was the battleground for the bloody and pivotal Battle of Gettysburg in July 1863, Pennsylvania’s role during the American Civil War amounted to much more than one major confrontation between Union and Confederate forces. Several smaller battles took place in the state during the Gettysburg campaign. York was occupied by the Confederates in late June 1863, and most of Chambersburg was destroyed by fire on 30 June 1864. 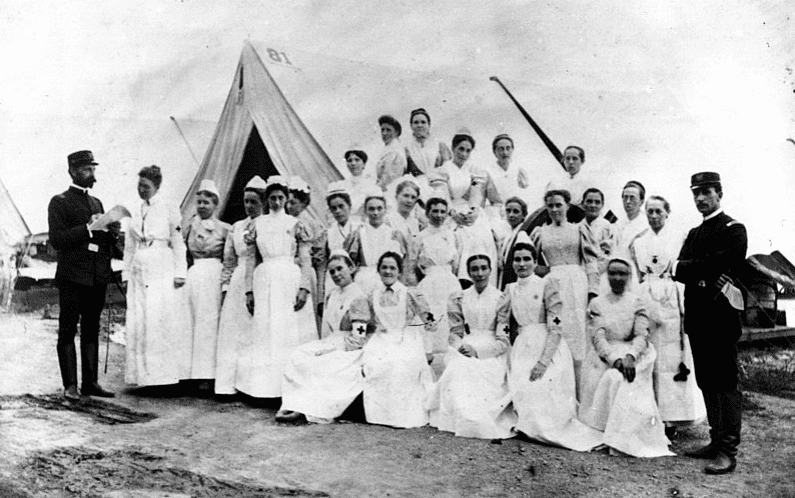 Photo: Union nurses during the Civil War, 4 January 1862. Credit: Wikimedia Commons. The following year, the Cooks moved to Willits, California, and Mary was once again reunited with her family and the growing Sawyers-Case clans after 20 years of living apart. Photo: arch at the entrance to Willits, California. Credit: Library of Congress, Prints and Photographs Division. Willits was and remains a small town in Mendocino County about 20 miles north of Ukiah. 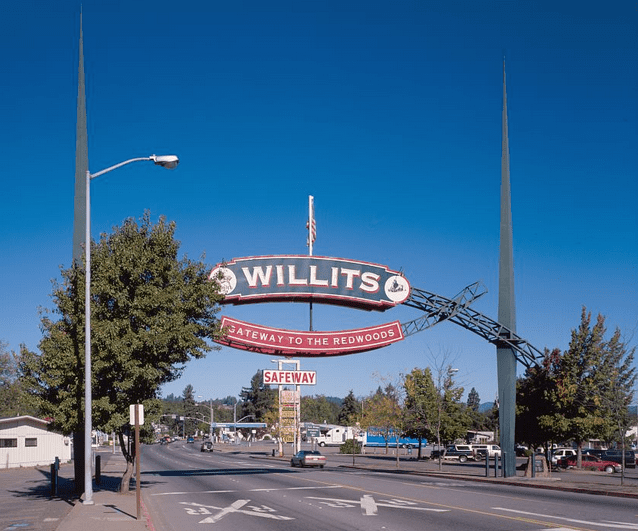 As the present-day sign says on the arch across the main street, Willits is the “Gateway to the Redwoods” (the giant sequoia trees east of town situated on the eastern slope of the Sierra Nevada mountain range). However, Willits may be best known as the place Seabiscuit, the famous racehorse of the late 1930s, retired and spent his final years. Bertha was born in Willits in 1880. Total population back then was about 150, including the Cases and Sawyers who arrived in 1858, and George and Mary Cook and their six kids who came in 1876. Farming, logging and cattle raising were the principal industries. Bertha married George and Mary’s youngest son, David. “Talk about a wild and wooly town, Willits was it. There were two big mills, Muir Lumber Co. and Northwestern, and the railroad was going in. There was only one marshal and those loggers, cowboys and railroad men would come in town on a Saturday night. Why a woman wouldn’t dare walk up the street! “The marshal – I can’t remember his name, but I think it was Livermore – well, he would deputize several men, but it didn’t do much good. Different ones would come in town and ride their horses up and down Main St. and into the saloons. One fellow who had quite a ‘Brannigan’ on told the marshal to get on his horse and gallop to the bridge north of town. Mary and George built a home on Main St. and raised their six children to adulthood. Their second son, Charles Hamilton, died in 1896 at the age of 28 and is buried in Santa Barbara. He was not married. Their other kids married and were starting families. Their youngest son, David Godfrey, married Bertha Beattie just one month before the tragedy that befell their town and family. The majestic Palace Hotel on the east side of Main St. caught fire and, because of the heroic efforts of the volunteer bucket brigades, the flames were held in check until everyone got out safely. Once the flames consumed the hotel, the fate of the east side of town was sealed and the fire made a clean sweep of everything: Wells’ saloon, Sam Blodes’ barbershop, the South End millinery store, Mrs. Good’s barbershop, Harmes’ butcher shop, J.C. Stays’ merchandise store, Tom Moore’s restaurant, Dryden’s livery stables, Mrs. Longland’s hotel, the printing shop and many others. All told, 34 buildings were lost. Many of the homes in town were also destroyed. George and Mary Cook’s house was one of those burned to the ground. Any of the letters from President Chester Arthur and his son that Mary kept were likely lost in the fire. The home of the newlyweds, David and Bertha Cook, was heavily damaged. 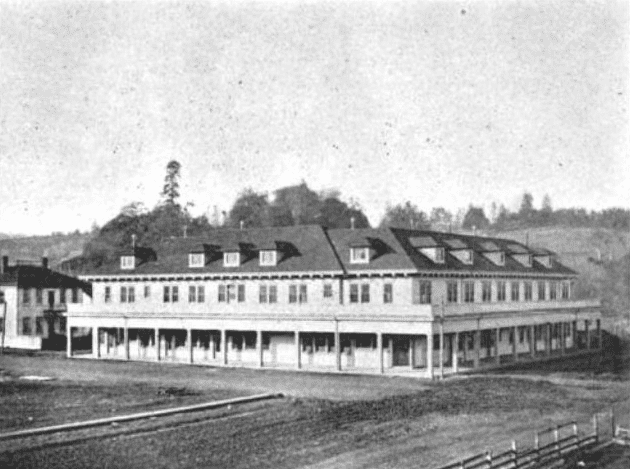 Photo: a view of the Willits Hotel in Willits, California, taken on 5 May 1903. The hotel was destroyed 18 April 1906 in the Great San Francisco Earthquake, killing at least one person. Credit: Emerald Triangle News; Wikimedia Commons. The hardy citizens of Willits rebuilt their town, including a fine new hotel aptly named the “Willits Hotel.” It would be less than five years before another natural disaster struck the town. The first shock waves from the great San Francisco Earthquake slammed into town in the early morning of 18 April 1906. In San Francisco, over 3,000 were killed and 80% of the city was levelled by the magnitude 7.9 quake. Although more than 130 miles away from San Francisco, there was a lot of damage in Willits. Several buildings on Main Street were destroyed and there was one fatality. C. L. Taylor, the manager of the Willits Hotel, was standing on the balcony of his second-floor room when it collapsed. He was buried by the bricks and rubble of the crumbled hotel. After her home and husband were lost in the 1901 fire, Mary Cook built a new home on Wood St. Fortunately, she and her house were spared by the earthquake. The last 18 years of Mary’s life were spent relatively peacefully in Willits. She was well looked-after by her five surviving children and their spouses: Dave, Wade, Frank, Harry and Martha Jean. Two of her six half-sisters were also residents of Willits. Mary also doted over her twelve grandchildren and five great-grandchildren. Mary passed away in her home on Wood St. on Thursday, 26 June 1924, surrounded by family. She was 85. Mary had struggled with her health for quite some time, and spent most of her last year in bed with a lingering illness. Mary could certainly be remembered for all of the suffering she endured: the tragic deaths of two husbands; the losses of her mother, three brothers and a sister before Mary turned ten years old; and the early deaths of three of her children. However, Mary’s legacy is a long life filled to the absolute brim with adventure, perseverance, grit, a fierce determination to never give up or in, and her steadfast care, service, love and devotion to her family and friends, and the many souls she befriended on wagon trains, shipwrecks, battlefields and everywhere she called home. Photo: the author with family members; photo taken on their “roots” trip to Willits, California, last week. From left: Casey Gauntt; his Uncle Stanford Case (89) and his daughter Diana Case Brown; and their second cousin Kelley Case Brackett, who lives on the property her great- great-great grandparents James and Melcena Case (wounded in the Indian attack) homesteaded in 1857. Credit: Casey Gauntt. What happened to Mary’s sister, Melcena Sawyers Case? Jim and Melcena Case and their two daughters relocated from Petaluma to Willits in 1860, and rejoined her parents and her brother, Mountjoy, who had settled there two years earlier. 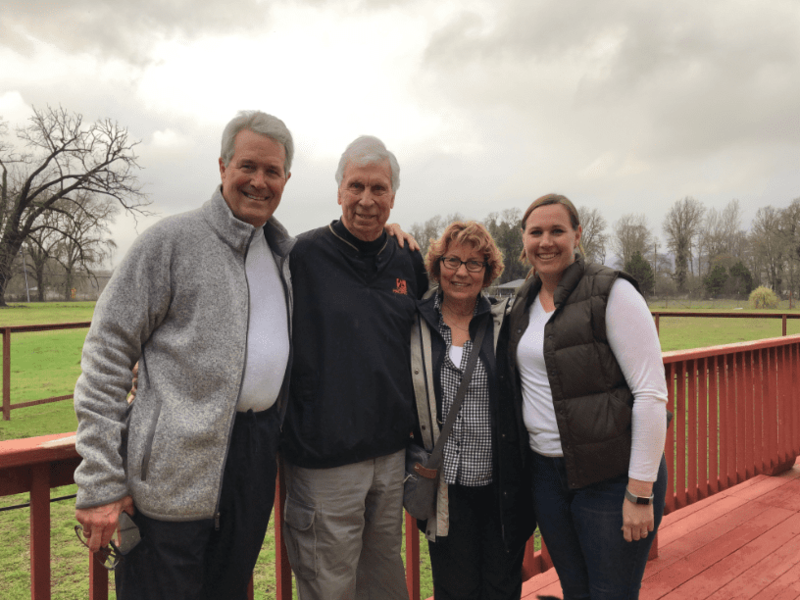 Jim purchased a tract of land for a farm and, with help from his family and neighbors, built a house. Jim and Melcena brought three more children into this world in Willits: James Lester, Tillie and Drury Goldman. Melcena never did recover from the wounds she suffered in the Indian attack of their wagon train in 1854, and for the last 20 years of her life she was mostly bedridden. Melcena passed in Willits in 1904 at the age of 77. (19) At the time of her death she had nine grandchildren. Her husband Jim lived in Willits another ten years before his passing in 1914. Jim Case donated the land for the first school in the area, known as Sawyers School, and another acre for Sawyers Cemetery in town, using his wife’s maiden name in both cases. (20) Jim Case wasn’t much for self-promotion. What happened to Mary’s brother, Mountjoy King Sawyers? (21) Mountjoy, or “Joy” as he was called, was 23 when his parents moved to Willits. He helped his father, Tom, clear land, plant fields and build shelters for livestock. Tom continued with his trade of cabinetmaking, building much of the family’s furniture and helping with the building of other homes. Joy married Hester Ann Whited in 1871, a young lady he had been courting for many years. The Whiteds were a very large family, and there would be numerous marriages over the years involving Whiteds, Cases and Sawyers. Joy and Hester moved to a large piece of land he had homesteaded called Deer Ridge Ranch. They built a fine home on the property with a handsome staircase leading up to the second floor. There was a large garden with fruit trees, and the usual milk cows, horses and chickens. In 1873, Joy was ordained as an Elder and Pastor in the Baptist Church and remained active the rest of his life. His ministry covered a wide area, and he took frequent trips by horse and buggy to tend to his flock. Joy’s dad, old Tom Sawyers, passed in 1879 at the age of 80, and he is buried in Sawyers Cemetery. Now known as Little Lake Cemetery, there are a lot of Sawyers, Cases and other kin buried there. Joy and Hester lived on Deer Ridge Ranch for 30 years and raised their children to adulthood on that place. Murvin and Tom helped out with running the ranch and also hired out to other ranch families in the area. In 1903, the Sawyers family made a huge decision, prompted largely by Frank Standlee who had married Mountjoy’s daughter, Sarah Ann, two years earlier. Frank was convinced there was still plenty of wealth to be found in the gold fields of California. He kept after the aging Joy about the dream his father, Tom, had when the family first came to California in the 1850s seeking to make a fortune in gold. Joy, now 68 years old, perhaps had forgotten that he and his father had little to show from more than two years of toiling at Rough and Ready, and that the only one in their family who had any luck, sister Mary’s husband Sam, never got a chance to enjoy the fruits of his labor. If Joy asked for the counsel of his younger sister, Mary, she didn’t change his mind. In any case, after months of discussion, the decision was made. Joy and his son Murvin would join forces with Standlee, and the families of all three would form a wagon train and travel together to seek their fortunes. Sometimes, it’s just in your blood. Joy and Hester sold Deer Ridge Ranch and everything else they owned except a wagon, a team of horses and some furniture. Along with Sarah and Frank Standlee, Murvin and Millie Sawyers and their children, three-year-old Thelma and her one-year-old brother Othel, the group set out for Mount Bullion – attractive name – in Mariposa County on the eastern slopes of the Sierra Nevada mountains, near the entrance to Yosemite National Park. The deja vu of it all is rather eerie. In 1853, Mountjoy’s father, Tom, and his new wife Peggy sold everything they owned in Missouri. The first children they had together, also aged three and one, together with the three surviving kids of his first marriage, Melcena, Mountjoy and Mary Elizabeth, formed a wagon train headed for the gold fields about 300 miles north of Mount Bullion. The route of this new band of hopefuls took them south through Petaluma and then across San Francisco Bay by ferryboat, an experience that spooked all the horses and nearly brought an end to the journey right there. This wagon train took many weeks and was terribly hard on the women and children. Today, the 300-mile drive from Willits to Mount Bullion takes a little under five hours. In 1903 the roads were primitive and, after they reached the foothills, a large portion of the trip was uphill over rocky terrain that the wagons could only cover if everyone got out and went on foot to ease the load. They finally reached the small mining town where they were to live for the next two years. Housing was scarce but the men managed to get two primitive wooden houses put together before the first snows came. The winters were severely cold, and life was hard. Millie was pregnant with her third child and in the middle of the first winter, December 1903, Lloyd Mountjoy was born. The baby was premature and, of course, there was no doctor in the area. Murvin fashioned an incubator out of a cracker box lined with clean soft bits of blanket, which was kept warm beside the wood burning stove that the family took turns stoking around the clock for weeks on end. By such loving and devoted care, the baby was kept alive. Lloyd reached the age of 64. Things were not going well with the mining. Joy and Hester were getting too old for the hard life they were enduring, and all were homesick for the rest of the family. In 1905, the quest for gold was forsaken, and the weary group made the long journey back to Willits. Joy was now 70, Hester 55, and all proceeds from the sale of Deer Ridge Ranch had been lost in the ill-fated Mount Bullion adventure. With the help of his sons, Joy built a one-room cabin of hand-hewn logs on a property owned by his daughter Dora and her husband, Sam Winans. Tom Sawyers’ second wife, Peggy, died in 1914. She was survived by her step-children, Mountjoy and Mary Elizabeth, her 7 children with Tom, 27 grandchildren and 35 great-grandchildren. Peggy was laid to rest next to her husband. By 1915, Mountjoy was in failing health. That year the International Exposition – precursor to the World Fair – was held in San Francisco. Dora and Sam attended the Exposition, and upon their return to Willits, they told her father of the wonders they had seen at the fair, including a flying machine invented by some brothers named Wright. Old Joy, who read his Bible daily to the day of his death, answered, “The Bible tells us that the day will come when sermons are delivered through the air. I guess that is how they will do it.” At that time, of course, no one dreamed of anything as fantastic as programs beamed through the air by radio or television. An old friend of Joy’s, Luther Baechtel, had a new Ford automobile which he drove in the funeral procession, but it spooked the horses pulling the hearse, so it was relegated to the rear end of the procession. The hearse that carried Mountjoy to Sawyers Cemetery was later placed on exhibit in the Mendocino County Museum. (1) The Sacramento Bee, Women and Children First, November 23, 1901. (3)1860 Federal Census. The Census was compiled in June of 1860, and Mary’s daughter’s age is listed as 4. (4) Willits News, A Mother of California, May 4, 1923. (6) Per the 1870 census, the Cooks were still living in Washington County, Pennsylvania, with their growing family. Mary’s daughter Martha/Lizzie was not listed as living with them. She would have been 15 at the time. Maybe it was an oversight, or perhaps she had moved in with other relatives of her father, Samuel. (7) Thomas Carnegie Burnett, The Family of Mary Elizabeth Sawyers (Swan) (Cook); as recalled by Blanche M. Burnett a granddaughter of Mary Sawyers Cook; part of the collection of the Mendocino County Historical Society in Ukiah, California. (9) The Willits News, Bertha Cook Celebrates 103rd Birthday, May 4, 1983. (10) The Press Democrat, Mrs. Cook Remembers When History Was Made in Willits, October 19, 1955. (11) The Willits News, Mary Elizabeth Cook Obituary, July 4, 1924. (12) Headline of the June 12, 1901, edition of the Little Lake Herald. (13) Ukiah Republican Press, The Town of Willits Is Almost Completely Destroyed by Fire, June 7, 1901. (14) The Press Democrat, Mrs. Cook Remembers When History Was Made in Willits, October 19, 1955. (16) The Press Democrat, Mrs. Cook Remembers When History Was Made in Willits, October 19, 1955. (17) The Willits News, Lived an Eventful Life, July 4, 1924. (19) Little Lake Herald, A Sad Week, October 19, 1904. (20) The Willits News, The Sawyers Family, February 12, 1975. (21) Much of this is attributed to The Willis News, The Sawyers Family, February 12, 1975. (22) The two oldest brothers of my grandmother, Henrietta Ellis Case, were taken in that epidemic in Tulare County, California. (23) The Willits News, Rev. M.K. Sawyers Died Last Monday, 6 Nov 1915. The True Story of Mary Cook, Part II: Wagon Trains, Gold Rushes, Shipwrecks, Wars, Fires, Earthquakes, Love & More!